Does this book need any introduction? Really? You've read my blathering about how adamantly I love this series and how much I was looking forward to this--the final book in the trilogy--and how difficult it is for me to accurately convey my love for one Alan Ryves. It had to be in my top three most anticipated novels of the year, and I was pestering my local bookstores shamelessly for weeks before it was due to come out. Two books in, and I already feel as though Sarah Rees Brennan is one of those authors I can trust with my literary heart and expectations. She delivers, and that's all there is to it. So I can honestly say I had no qualms whatsoever going into The Demon's Surrender . Not a one. I feared for loss of life and limb (and love) on several fronts, but I had no worries that the story would not be absolutely awesome or that the characters would not get exactly the ending they deserved. And how many times can you say that going into the final book in a beloved series? That's right. Not that many. If you haven't had the chance to pick up The Demon's Lexicon yet, I really urge you to give it a go. Because this? This is just fantastic storytelling. Warning: There will undoubtedly be a few unavoidable spoilers in this here review, so if you have not read the previous two books, proceed at your peril. Okay? Okay. In this third and final volume, all the chickens are coming home to roost. With the state of the union being what it was at the end of The Demon's Covenant , the Ryves brothers, the Market folk, the Crawford siblings, and the Aventurine Circle have all come to London for what will undoubtedly be the final showdown between the magicians, the demons, and the not-so-mere mortals. In the case of Sin Davies, the stakes have been raised immeasurably as Merris Cromwell--the outgoing leader of the Goblin Market--has set a brutal contest for the role of her successor. Sin must reluctantly face her sometime friend, now rival Mae to keep the life she's always assumed would be hers. Meanwhile, she has to take care of her two little siblings, maintain her low profile at school, and struggle to make heads or tails of the infuriating Alan Ryves. Because it quickly becomes clear that Alan and his little brother are at the very heart of the conflict between the power-hungry magicians and the demons they strive to master. And the normally savvy Sin must use every wile in her considerable arsenal to parse out the real loyalties lurking behind the carefully crafted facades surrounding her. "Time for our dance?" Nick asked. "Yes," said Sin. "And I wondered if Alan might like to sing for us." Alan stared. Sin widened her eyes at him, schooling her face into a picture of innocent inquiry. "Are the dancers going to play nice?" "If you are," Sin said. "Maybe." She didn't know what she expected, but it wasn't for things to be easy, after years of being at daggers drawn, as if all she'd needed to do was reach out once. She reached out and Alan took her hand. She was startled by how that felt: Alan's hand strong and gun-calloused, but holding hers rather carefully, as if he was worried he might hurt her. It was ridiculous to be startled. She knew Alan was usually gentle. She'd been watching him play with children for years. And she'd seen Alan kill whoever got in his way, whenever he had to. She'd just never really thought about the contrast of how he presented himself and who he actually was. Not until he'd stepped between two armies and taken her brother and a magician's mark. Sin looked away as he levered himself up from the log--surely he didn't want her to see him struggling--but she didn't let go of his hand when he was up. She led Alan to where the dancers were talking, Nick stalking in their footsteps like a jungle cat on bodyguard detail. "Alan's going to sing," she announced. "Cool," said Chiara, who knew a cue when she heard one. "I can't tell you how pleased I am," Matthias told Alan. Alan slid his fingers easily out from between Sin's, watch glinting in the firelight under the frayed edge of his shirt cuff. He hesitated briefly and then curled his fingers around one of the belt loops on his jeans, as if he felt he should do something with his hand. "Didn't you try to throw me to the magicians last time we met?" he asked Matthias. "Sure," Matthias replied, flashing his skull-like grin. "But I didn't mean anything personal by it." "That's all right then," Alan said, sounding truly amused. He smiled by degrees, like a stage curtain being opened by someone who knew how to do it, making you wait just long enough. Most of the dancers thawed enough to smile back, and Sin was startled to realize that she had been wrong all this time when she'd assumed Alan was winning over all the old guard of the Market just by being an enormous nerd. He had charm. He'd just never bothered to use it on Sin. "We have the exact right guitar for you," Matthias said, trying to usher Alan away to the other pied pipers. "Don't ask me how I know. I always know. I've been watching your hands." "I feel very reassured," said Alan. "Also a little violated. There is that." Ah, Alan. You and the crafty way you wield all that understated charm. It was perfectly delicious watching Sin's opinion of Alan, Nick, Mae, and Jamie evolve over the course of their adventures together. Looking at each of them from her "outsider" perspective was enlightening, even as it was difficult to see some of their greater flaws brought out into the harsh light of day. Which brings me to Jamie. Because if we're talking most flawed, Jamie gives even my beloved Alan a run for his money. I missed Jamie. He didn't get quite as much page time as I would have liked, though I understand why. And, given that the scenes he was in were almost unutterably painful, I probably couldn't have handled too many more. Which, of course, only enriched the overall experience. But, wow. Cue the heartbreak I referred to earlier. But the lack of Jamie is balanced to a certain degree by the presence of Sin. Sin who is so incredibly strong and unwavering that she brought a fierce smile to my face over and over again. Because she never apologized for being strong, for not needing saving, for not being ashamed to make the first move, for baldly declaring her feelings on a subject, or for refusing to alter her loyalties because it would make things easier. Yeah. My love for Sin is as unapologetic as she is. And these beloved characters of mine? They all of them needed Sin, whether they realized it or not. She brought some non-psychotic humanity to the group, and she managed to flap the unflappable Alan. For which she earns my undying affection. Two such talented liars should definitely know each other. Be partners in crime, even. It was funny and moving and wickedly enjoyable watching them size each other up, surprise each other, toy with each other, and eventually come to terms with each other. Truth? 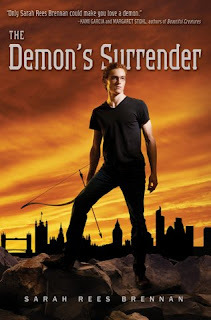 The Demon's Surrender was everything I hoped it would be--filled to bursting with magic, wit, danger, love, and awesome weaponry--a spectacular ending to one of my very favorite series. Yep. Exactly that. I'm going to miss these characters, too. Alan and Sin, huh? Didn't see that one coming. I'll drop by the bookstore today and look for a copy of this. Oh my copy is on it's way! Cannot wait for it to arrive, I'm so pleased you loved it; means I can look forward to reading it and not worry it's not up to high standard of the first two. Didn't read further as I don't want to be spoiled. But did you find that the series is getting better and better after Demon's Lexicon? I still haven't even read the Demon's Convenant. I was in tears multiple times too ~ oh Alan, oh Nick, OH Jamie! I was also giggling like crazy on every other page. I can not wait to see what Sarah Rees Brennan does next. *sigh* I really, really don't want this series to be over with. I've been holding off reading this one so I can do a reread of the first two but I think I just need to dive right in for a Mae, Nick, Sin, Alan and Jamie fix. I wanted to like these books so much -- I like the author's blog and I've liked short stories she's written, but there's something about the voice -- it doesn't "jibe" with me at all. I couldn't even finish the first one. I found myself reading paragraphs over and over again and trying to figure out what the heck they meant. I also had a problem with the constant joking during life and death action sequences. But I'm pretty much alone, I think. FWIW, I have the same problem with Cassandra Clare's books, which are beloved by millions.